This outfitter runs a family-owned and operated business on some very remote ranchlands in northeast Wyoming. 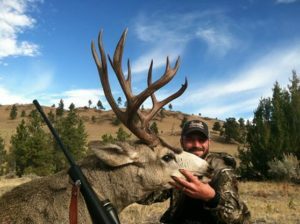 The outfitter hunts his own private ranch and also has leases consisting of about 75 square miles in northeast Wyoming. Nearly 100,000 acres! The property is located along the Little Powder River, which boasts one of the biggest herds of non-migratory mule deer in the state, and it has some giant deer. He has a substantial elk herd, also non-migratory. His hunt area also has a lot of good antelope. Drawing tags here for antelope is normally 100% draw, with leftover tags available. AND THE SLEEPER HERE IS HIS WHITETAIL HUNTING! SOME HUGE BUCKS! The outfitter oversees every one of his camps. Putting in over 150 days a year in the field, the outfitter knows the ropes and what he expects from his guides and employees. That’s why he is so successful. You will come away a better and more knowledgeable hunter. He closely manages the harvest on his properties to assure guests the opportunity at a trophy animal. There are no fences and the hunts are strictly fair chase. Most hunting is by spotting and stalking using spotting scopes and binoculars. The outfitter’s guides try hard to get the hunter the closest, most high-percentage shot they — can because the first shot is always your best shot. The guides are good judges of trophy quality and most shots end up being under 200 yards. The hunter makes the final decision on the shot based on what you are looking for and the guide’s input. BIG WYOMING WHITETAILS – HOT AND VERY EXCITING! New here is a November rut whitetail hunt from November 1-30 in Deer Unit 17. The Game and Fish Department reset the unit boundaries in 2016, and he Unit 17 now in Region C for deer. This was done in order to allow whitetails to be hunted during the November rut in hopes of reducing their numbers, as Game & Fish feels there are too many! 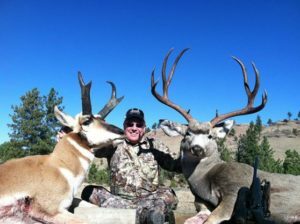 WE AT HUNT NATION ARE VERY EXCITED TO BE ABLE TO OFFER YOU THIS WHITETAIL HUNT, AND AT OUR EXCLUSIVE DISCOUNTED PRICE! The new rules give the outfitter a new opportunity to hunt the whitetail rut. These deer have hardly been touched for years. Most have died of old age. And with the huge amount of land, we have no doubt there are 150 and 160 class whitetails out there, along with plenty of 140 class. And likely some 170 class too. THIS MIGHT BE YOUR BEST CHANCE EVER TO KNOCK OVER A REAL TROPHY WHITETAIL. They are uneducated, under-hunted, fat, old and, while never pushovers, they should not be terribly difficult either. The outfitter’s vast area has about 15 miles of creek bottoms to hunt (the bucks chase does along these bottoms during the rut), generally by spot and stalk. AND DRAW ODDS ARE AWESOME: at the Special level license ($660), your odds are 100%-even with zero preference points! At the Regular level license ($372), with a single preference point, your odds are still 100%! We saw the huge acreage he hunts and we honestly believe you will kill some giants here. If you want a whack at these deer, then please give us a call. He plans to hunt November 1 to 15. All hunts include guiding, meals and lodging. Lodging is at the ranch described above. Terrain is relatively modest, but it helps if you can walk, spot and stalk. The terrain lends itself to that style, although stands are possible. 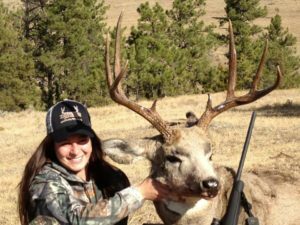 MULE DEER: We believe that it is a reasonable expectation to be 100% successful on a big muley on this operation’s nearly 100,000 acres. In 2017they took two bucks over 190” with one being over 200. We are a bit conservative however and prefer to say that we expect clients here to kill 170” to 185” bucks, with a chance at better. Shots can be long – so do be prepared with a bipod or sticks and plenty of practice under your belt. You do NOT want to blow the shot of a lifetime! Remember, with low pressure some truly big deer live here. Very limited availability, so if you want to hunt here you need to book as early as possible. One huge plus here; normally at the Special price level this Region C tag is a 100% draw! That means you can draw almost every year! Try to find a trophy muley in an area like that most anywhere else! Hunts are 4 days long- which is enough with the current deer numbers and low pressure. He offers an excellent 4-day archery hunt for these speed goats. In 2014, he had several guys posted where antelope normally sneak into the acres of alfalfa. One guy killed in 11 minutes, the other guy in 17 minutes! He has somewhere close to 1,000 acres of alfalfa in a variety of smaller parcels, so lots of opportunity. He normally expects 100% opportunity with bow at 50 yards or less, on bucks. 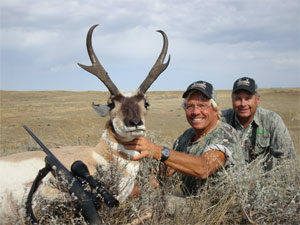 It is also possible to do a two-antelope buck hunt! There are that many tags and that many antelope. ANOTHER MAJOR PLUS HERE IS THAT IN AREA 17 YOU CAN EXPECT NORMALLY TO BE 100% SUCCESSFUL IN DRAWING THE TAG. Antelope horn sizes range from 13 to 15 inches, with some opportunities at trophies up to 16 inches, although 16 is rare. This outfitter has taken a number of TV personalities and outdoor celebrities over the course of his 30 years in the guiding business. In early 2018 he sold his old ranch headquarters and now lodging is on on one of his big leased ranches. Lodging is planned to be several camp trailers; with a tented cook and dining room. It will feel much more like a wilderness deer hunt, which we like. Meals are good solid food and plenty of it. This is not the hunt for anyone wanting posh lodging- it is for the serious hunter. Some of his better known past client include Jim Cabela, the Christensen Arms President, Pete Shepley from PSE, Tom Miranda, Bob Robb and others. “Paul and I want to thank you for arranging our hunt with this excellent outfit. We were successful in hunting antelope. The outfitter set us up on a spot to hunt from a blind on opening day. My son Paul got his buck 27 minutes later, about a 92-yard shot. The outfitter told my son that he’d shot a very good buck. Then he drove us out to spot and stalk antelope. I also got my antelope on opening day morning. My son Paul is legally blind. 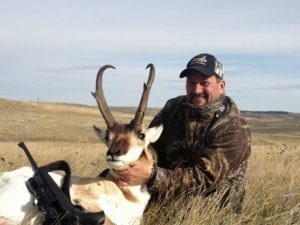 Thanks again.” – Joe and Paul R.
ELK HUNTS In recent years the elk herd here has grown hugely, and with the area being 90% private ranches, they have gone relatively unmolested. The result is unpressured elk with good age structure, plenty of feed and relatively hunter-friendly terrain for stalking and glassing. Elk here will average 270 to 330, but there are much larger ones too (there are some 330-inch bulls using the private-land hayfield the outfitter hunts in Unit 129, which is a general license area.) . Based on our personal inspection, we honestly think this is one of the very best places to tag a truly big bull. These bulls have age, food, good genetics, and no pressure! We also REALLY like that this is a General Tag area, which means historically you can draw on the higher priced Special license level ($1,057) with just one Preference Point. It is also a 100% draw at the Regular License level ($690) with only 2 preference points. Now the really exciting part: the season here is a full 2 months long, starting September 1, SO YOU CAN RIFLE HUNT THESE ELK DURING THE BUGLE! It is nice when the bulls are screaming, “Hey, I’m over here!”. And the outfitter does not allow a bow season beforehand, so these are totally unpressured bulls. But, if you are a bowhunter, you can certainly choose to use your bow during the gun season, and bring your rifle as a Plan B.
COW ELK: Also excellent cow elk hunts here for all the same reasons. Cow elk season starts November 1. LICENSES: Wyoming has a 2 tier license system- the Regular level (less expensive) — and the SPECIAL level (more expensive). At the Special level, the State sets aside 40% of the available tags for anyone willing to pay a bit more. This can often double or triple your odds of drawing, often taking you from 30 to 50% odds to 90 to 100% odds. NOTE: You do NOT need to apply for the SPECIAL Level license for Antelope. You WILL need to apply for the SPECIAL Level license for Deer. We STRONGLY recommended you apply for the SPECIAL license for Elk. INCLUDED: Transport to/from Gillette Airport, guiding, food, lodging, private lease/harvest fees and field dressing. NOT INCLUDED: State of Wyoming License fees, transportation of harvested animal to processor, processor or taxidermy fees, and gratuities.